The fastest most beautiful and informative weather app with dynamic lock screens and mix and match live tiles to bring you the ultimate experience on your phone. Beauty meets brain in Amazing Weather HD; have the most aesthetically pleasing app with live HD animations or a sleek modern look, and get the most weather details in addition to quick 7 days overview, hourly data, charts, warnings, satellite images, detailed forecasts, GPS live tiles, lock screens and much much more! 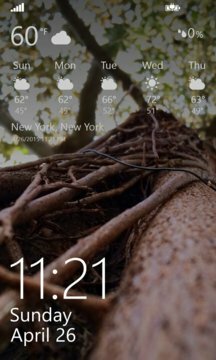 Bring new life to your phone with Lock screens, a collection of background images specifically hand picked and styled in two themes with a variety of options to display weather info in your own unique taste. The tiles are just amazing; they're beautiful, live, re-sizable and configurable for each location! We offer you the choice of 9 different tiles for front or back in three sizes. - 5 Live tiles and with auto location feature using GPS. - different cities and an optional auto location using GPS. - Customizable Live tiles themes for each city and two cool themes. - Weather Alerts.- Astonishing animations based on current conditions, and daily forecast. - Detailed current conditions data including UV, wind, visibility, humidity, pressure and more. 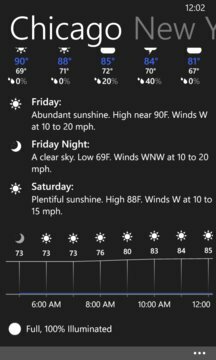 - Seven days quick view weather forecast. - Detailed text and daily forecast.- Radar, infrared and satellite imagery. - Access to nearby Personal weather stations using GPS location. - Access to nearest station using GPS location. - Weather data provided by Weather Underground. More amazing updates are in the works! - Added new medium daily live tile.